A good night’s sleep. That’s all a traveler really wants when he or she arrives at a hotel room after a long day of travel. Some people are more picky than others about the mattress type or pillows, but most just want to sleep. For travelers who use wheelchairs, however, a good night’s sleep in a hotel room – even one designated as wheelchair accessible – may be a pipe dream depending on a multitude of factors. 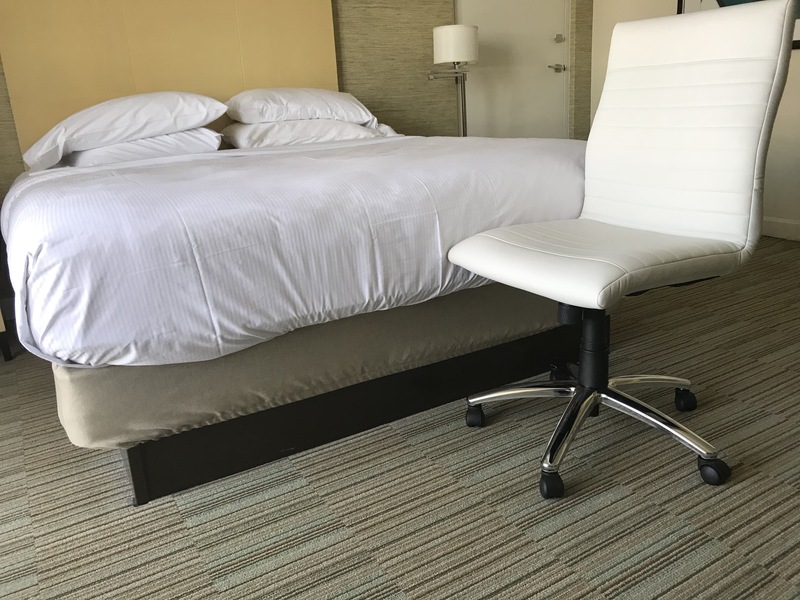 In this post, I take a look at the debate over the appropriate bed height in wheelchair accessible hotel rooms, the apparent lack of two-bed accessible rooms for families traveling with a wheelchair user, and what hotels can and can’t (or won’t) do to make things easier for wheelchair travelers. Aiming high or going low? No two people with physical disabilities and/or the need for a wheelchair are the same. That means that their daily living needs are totally different as well, which includes how they sleep. We’re able to customize our homes, and specifically our bedrooms, to meet our particular needs. I’m a power wheelchair user who can’t walk at all or lift my legs, but I can stand, plant my feet in one spot, and pivot to transfer. Many manual wheelchair users have no lower body control, but have good upper body strength and can also self-transfer. For people like us, lower beds make it much easier for us to transfer safely and comfortable from our chairs to our beds. For wheelchair users who require a considerable amount of care/assistance, a higher bed is likely better. This often means there is more space under the bed to roll the supporting legs of a hoist or lift. A higher position also makes it easier for a caregiver to dress or reposition a wheelchair user who needs extra care, or for someone with knee or hip problems to get up out of bed. Whoever designed this hotel room forgot I’d need access to the bed and blinds. So, what happens when a wheelchair user travels and has to stay in a hotel room? It’s important to know that non-fixed furniture in US hotel rooms do not fall under the mandate of the Americans with Disabilities Act. This is why you will often find heavy and bulky furniture in wheelchair accessible rooms that are placed in a way that block access to the windows, outlets, nightstands, and thermostats. This is also why you will come across a wide range of bed heights and styles from hotel to hotel – even within the same chain, due to the fact that the majority of hotel properties are now franchised. Higher platform beds seems to be the new trend at US hotels, meaning that many beds are not adjustable (i.e. they can’t be lowered in any way) and there is no space underneath to place a hoist. This double whammy poses problems for wheelchair travelers who need either a high or low bed. Not that the winner of that debate would matter, as ALL hotel beds are the same (more on that later). Do hotel owners think we don’t have families? In May 2018, I was supposed to embark on a 3-week road trip from Orlando to Mount Rushmore and back, stopping in ten cities along the way. I ended up having to cancel the trip, but not before hunting through over 100 hotels to find accessible rooms with roll-in showers and two beds at each location. I was only traveling with a friend on that trip, but I have two children and my mother often comes with us on family trips. I’m also an accessible travel agent, and spend a lot of time booking (and searching for) accessible hotel rooms for families with a wheelchair user. It breaks my heart to have to tell parents that they have to split their family up into two separate rooms – often not near each other – because the accessible room has only one bed. The ADA does have rules when it comes to the number of beds that should be allocated to wheelchair accessible rooms. Per the ADA, hotels should provide people with disabilities “choices of types of guest rooms, number of beds, and other amenities comparable to the choices provided to other guests.” This means that if 40 percent of a hotel’s regular rooms have two beds, then 40 percent of its accessible rooms should also have double beds. If for whatever reason that isn’t possible, then the ADA says: “…guest rooms shall be dispersed in the following priority: guest room type, number of beds, and amenities.” Unfortunately, many hotels ignore these dispersion requirements. Further complicating matter is the fact the ADA requires a much smaller percentage of wheelchair accessible rooms to have roll-in showers, as opposed to accessible tubs with just grab bars. Hotel rooms with roll-in showers sometimes require more physical build-out space into the sleeping area, which means more often than not, if you need an accessible room with a roll-in shower AND two beds (like many families), you’ll be out of luck. They do exist, and I was lucky enough to book some of them for my road trip. However, they are considerably harder to find, which often puts families in a financial pinch by having to resort to more expensive hotel rooms designated as suites. What are the options for hotels and wheelchair travelers? There was no way I was going to self-transfer into that bed! In April 2018, I stayed at a Hilton hotel in Fort Lauderdale with a platform bed that was 33 inches high. I asked the manager if there was some way to lower it. He said no. I asked if they could at least provide a rollaway bed. He said there were none on the property. In other words, there was no way he could help me. Fortunately, another more helpful manager brought a rollaway bed from another Hilton property so I could at least sleep somewhere, since all other hotels in the area were booked solid (I was there for a conference). 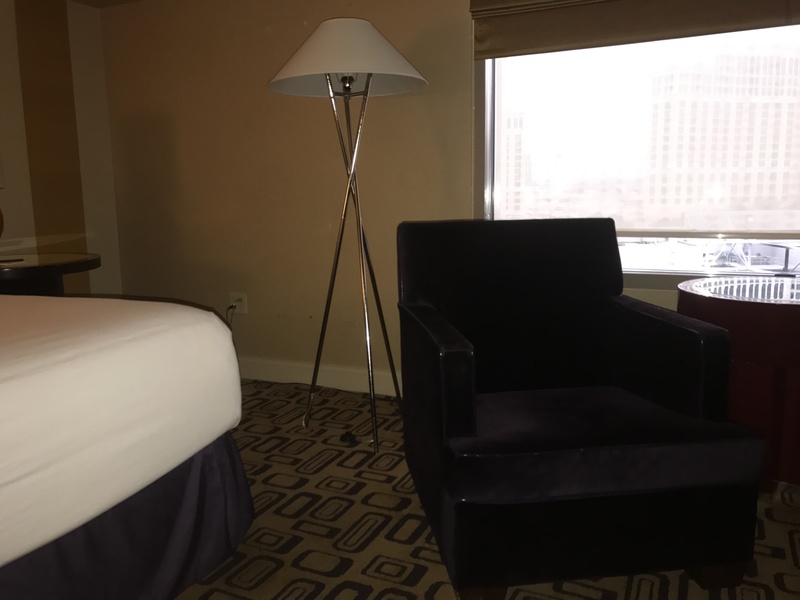 Had I accepted the first manager’s lack of options, I don’t know what I would have done, outside of booking a hotel room on extremely short notice over a dozen miles away – and possibly with the same bed-height (or worse, roll-in shower) problem. I learned a valuable lesson from that experience, which is to call a hotel before making a reservation to ask about the height of the bed. Hoist users definitely need to call to ask about the height of the space beneath the bed to ensure they can roll the lift’s legs under it. It wasn’t great, but at least I could sleep on this rollaway bed. But what can hotels do, and what should they do? This is an even bigger debate than the “right” height for a bed in an ADA room. Hotels aren’t mandated by law to do anything beyond what the ADA proscribes. Our comfort with regards to furniture then becomes a customer service issue and a money issue. Most hotels do not have different types of beds in their wheelchair accessible rooms, although I have seen this (in exactly two US hotels out of hundreds of stays). I imagine beds are bought in bulk, although I’m not sure how much of an extra expense it would be to buy height-adjustable beds for ADA rooms. And I’m not talking about electric ones; simply beds where maintenance can remove the legs (as opposed to a full platform) to lower it, or simply add bed-raising blocks for hoist users. As for families, it’s always a plus when hotels offer rollaway beds, although they sometimes don’t due to fire code issues. Sofa beds also offer additional sleeping space without occupying as much space as a second bed, and the tighter space in the room when the bed is open is only temporary. Be cognizant that a hotel’s willingness to accommodate you beyond ADA requirements will rest solely on the mood of the manager. I’ve had some who have bent over backwards to make me comfortable (and safe), and others who would have been happy for me to leave and stay elsewhere. 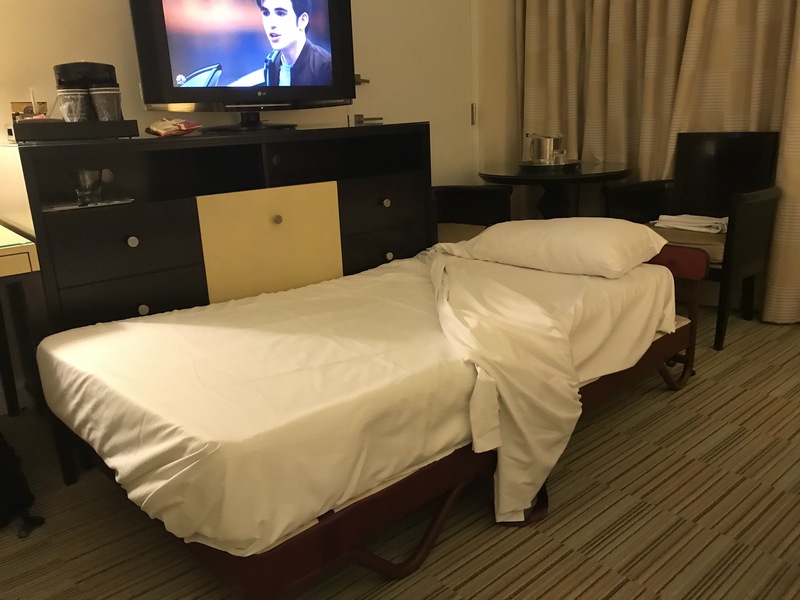 It’s not fair that we have to call every hotel where we’d like to stay and ask about bed specifications (not to mention bathroom photos), but that’s become part of the life of a wheelchair traveler. Lastly, know what your rights are under the ADA and stick to your guns when necessary, but be congenial rather than confrontational with managers when they are under no legal obligation to accommodate you. You never know when educating them about our needs may lead to positive industry-wide change. Is there any debate on how soft a bed should be?? Do softer beds make it harder for you to transfer? We prefer the softest bed available because it’s easier on my hub’s body, but does that play into things at all? In my experience travelling in Europe I have found that accessible rooms usually contain double beds (that can’t separate) and, if we are lucky, a pull-out sofa bed. So when I am travelling abroad with my 2 carers I share a room with one of them, and we have to get another room for the other. There was one time in Berlin that my two carers had to share the same double bed (both male) and they weren’t too pleased! It would be a lot easier if the double beds could separate. At least then we would have a choice. And I wouldn’t have to sleep on a pull-out sofa. Although I don’t really mind doing that. It would just be a lot easier there was a set of best practices that all hotels should follow. At least then the standard of accessible rooms might not vary so much. I’m 5′-3″, used to be “the average American shopper” height; now the figure is 5′-3.8″ or something close. Standard Building Codes have never favored us, though. “I asked the manager if there was some way to lower it. He said no.” This echoes my recent experience on a cruise ship. I asked if they had a wheelchair lift to get me over the wall that surrounds the swimming pool and was told they didn’t. I later asked someone else who made a call and then said they did. What I learned from this is it’s all in who you ask. My bed was also too high but I used my scooter to give me a platform to get on the bed (I’m 4’8″ tall). Shower. I have always said when creating these rooms, never consulted someone in a wheelchair. Some are good, some are not. ALWAYS need to phone ahead when booking an ADA room.. I have stayed at different Hilton’s in the last couple of years. On three occasions I couldn’t even open the door to get into the room. I am not in a wheelchair yet, I use a walker. The doors into the rooms were SO heavy that I couldn’t push them open and get my suitcase in at the same time. Once I went down to the desk and asked for help. The person at the front desk said I would have to wait until she was free as there was no one else working the desk. Another female guest offered to help me, and I accepted her help. After each visit at the hotel I wrote a note to Hilton about the doors to the room. I have also suggested that someone from the Hilton chain borrow a wheelchair and check in to one of their hotels. In one bathroom the sinks would have been accessible for a wheelchair, but someone decided that a bench under the sink with all the towels on it would be better than actually being able to get to the sink to wash up or to brush your teeth. My last visit to the Hilton just North of Columbia, SC was great! The door was lightweight, the shower was wheelchair accessible, the room was large enough for a wheelchair to maneuver easily. The bed was high. That would be my only complaint. Always submit a review and offer good suggestions.